Adrian Lant was the overall winner of the February Open competition with his print entitled ‘Determination’. He narrowly pipped Lynda Beynon who had Best DPI for ‘Blue Damsel On Grass’. The judge was Rob Mitchell (right below). We are going to Warwick!…..Gwynfa will once again be representing the WPF at the PAGB interfederation PDI championships at Warwick after winning the 2016 Ace of Clubs PDI competition. Gwynfa finished 1st ahead of Inn Focus and Tenby. Leigh Woolford won a ribbon for the best colour DPI with “Rainbow Over Stokkessnes”. Many thanks to all the Gwynfa members that turned out to support the club. Special thanks to Heidi Stewart for her assistance selecting under pressure for the second round. An exciting day out hosted by Newport camera club, expertly judged by Peter Cheetham, Graham Reeves and Pete McCloskey. Followed by Bridgend, Barry, Ebbw Vale, Western Valley, Swansea, Cardiff, Newport & Vale camera clubs. Stop press …. Heidi didn’t win a raffle prize and is distraught. Thanks to RobBob Beynon for the report. Storming result for Gwynfa in the 2016 GB Cup! Gwynfa finished an amazing 6th out of 96 clubs in the open section of the 2016 GB Cup. Inn Focus were the top WPF club beating up by just three points but we finished above some of the most prestigious clubs in the UK, including Wigan 10, Edinburgh and Dumfries. Once again congratulations must go to Rob Beynon and his selection team for picking a great set of images. Huge congratulations also to all Gwynfa photographers. You keep producing such excellent work. This is an astonishingly good result for the club and everyone should feel very proud. The final placings can be found here. Stop Press: We’ve just learned that Steve Littlewood won the award for Best Monochrome for ‘Winter Storm’. Gwynfa had a very good result in the PAGB GB Cup (Nature Section). We finished joint 20th out of 96 clubs and the top club from the WPF. Well done to Rob Beynon for organising a good selection from out nature workers. 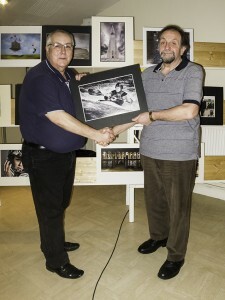 The Vale Camera club once again provided a warm welcome and a very enjoyable evening for the annual Vale 7 way battle. Congratulations to Rhondda camera club who came away with a well-deserved win closely followed by our hosts the Vale camera club. The closest Gwynfa came to winning an award was by former Gwynfa member Andy Baker, now of the Vale, who won the best colour print. The best mono print went to Pyle & Porthcawl. There was some interesting judging that kept everyone guessing the final result. It was great to see so many Gwynfa members turning up to support the club.